I would like to create this thread to shed some light on the work of Jorge de Zofia, a luthier based in Florida, USA. I shall abbreviate Jorge de Zofia as "JDZ" for brevity's sake. I got a tip (ahem-Lorenzo-ahem) about a JDZ being available for sale in Florida at a very attractive price, so I decided to go for it. I've owned the guitar for only a few days now, and already I am in love with it. I seem to discover how fantastic it is every day I play it, and it's like that "getting a new guitar" feeling over and over. Here is a video where the guitar was recorded through my trusty MXL .009 USB microphone. I added only a bit of reverb and compression, and I cleaned up the recording a bit as well as adjusted the volume. The sound you hear is more or less what you hear in real life. The purpose of this video is not to display my fantastic playing, but rather it was recorded in one shot so as to highlight the sound of the instrument. Basically, the guitar sounds very flamenco. 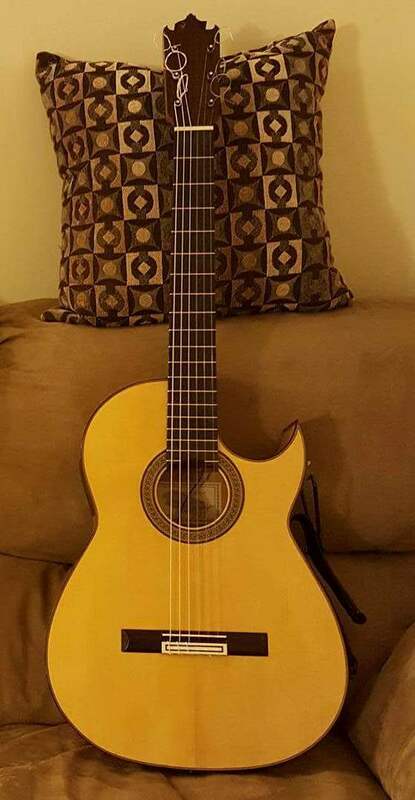 The playability is wonderful, and even though my left hand is weak and post-surgical, I am able to play the guitar effortlessly. The neck's profile, I feel, makes it easier to to barre all strings without having to exert tiresome pressure. The reason the guitar plays like butter is because Jorge adjusted it specifically for me when he realized it was coming my way. The previous owner wanted the action fairly high because he played hard with thick acrylic nails, however, I am a much lighter player. I expected it would be a simple saddle-filing process to achieve the lower action, however, Jorge went above and beyond (at minimal cost) to ensure the best possible outcome. He planed the fret-board down and re-fretted it. He also re-routed the saddle slot a bit lower to achieve a true flamenco setup (images of this work attached in the DropBox folder below), and I have to say the results are fantastic. There is just the right amount of flamenco growl, yet no bothersome buzzing anywhere on the neck, and only the lightest touch required to produce clean-sounding notes. On Jan. 5 2013 0:43:20, Andy Culpepper, one of our very own fantastic luthiers, stated, "I believe that certain people, like "El Polaco" Jorge de Zofia on this forum, have a true talent that manifests very early on in a building career. After talking with him for an hour or two on the phone I can tell that he has the attention to detail and the understanding of what makes a great instrument to produce saleable guitars almost immediately, which is what he has done." Modified Conde bracing - center five parallel with 2 elongated either side of center brace. 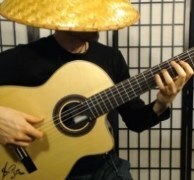 It's great to see an ever-growing network of great flamenco guitar luthiers in the USA. In working with Jorge, he was quite professional, friendly, responsive, and always paying attention to detail and the highest quality standards. Thanks Orson - yup, José Luis de la Paz endorses and plays Jorge de Zofia guitars. Here's Jorge playing what I believe is my guitar after it was built in 2013. Clearly, he plays it much better than I do. Congratulations Ramz, sounding great! Nothing beats being excited about a new guitar. just thought i would tag this onto the end of this thread as it's same maker. I have seen a guitar from Jorge de Zofia for sale on ebay, and it's not far away from me so I thought I might take a look, BUT in the pic of the label it says "United Kingdom" NOT "Singer Island - Florida" and the seller claims it was made for Vicente Amigo - there is some handwritten stuff inside that references Vicente, but I can't make out what it says.